Apart from the estate agent, Force and Sons, Panters was the longest lasting business in Sidwell Street up to 2014, when on the 25 September, the store closed for the last time. Thus ended 120 years of supplying the public initially with a drapery store. Samuel Charles Panter was born in 1869 in Landrake Cornwall. A market trader, he moved to Exeter at the age of 25 and opened his drapery store at 36 Sidwell Street in 1894. He married Miss Kose Lee, on 15 April 1895 and had two children–a daughter who died young, and a son Stanley, who followed him into the business. His bride was the sister of a future Bideford mayor. 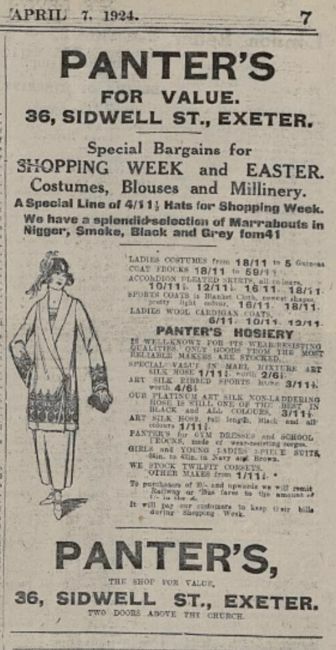 For the next few years, Panter placed small ads in the local press, for apprentices to work in the drapery trade, and for experienced staff, such as milliners. It wasn’t until December 1901 that he placed his first advert in the Western Times to promote the store at Christmas when he had a festive window display. As one advert stated, ‘USEFUL XMAS PRESENTS’ such as aprons, handkerchiefs, gloves and lace collars could be purchased at Panters. Located in Sidwell Street, his customers would have come from St Sidwell’s and Newtown–a new burgeoning working and middle class. The Christmas ads must have been successful, for in January 1902 Charles Panter placed ads for a winter sale. In December 1902, the Western Times wrote a Christmas advertorial. In January 1909, during the early hours of Christmas Eve, the shop was broken into and a cash box containing £13 was stolen. Panter was an advocate of the St Sidwell’s Shopping Week and for promoting trade in the area. He became very involved with St Sidwell’s Church, and was for eight years, a churchwarden, was one of the feoffees of the parish and was a manager of St Sidwell’s School. Politically a Conservative, he was a representative for St James’ Ward on the City Council for twelve years, from 1921. He was chairman of the Water Committee, and a member of the Education, and Lighting and Cleansing Committees. During the First War, Charles Panter supported the war effort by donating to the Mayoress of Exeter’s War Funds. In August 1918, at the age of 50, Panter had to appear at an Exeter tribunal to be exempt from the call up to the army. He was excused until 31 December, and became a special constable. Trade returned to normal after the war, and in 1922, Panter’s offered four prizes in the Shopping Week balloon race. Shopping week presented the chance to try more elaborate adverts with a detailed list of merchandise and a snazzy illustration. Samuel Charles Panter died on the last day of February 1933, aged 64. He suddenly became ill on the previous Sunday, and by Tuesday was critical, passing away on the Tuesday at his home of Pensilva, Whipton. He was interred in the Whipton village graveyard. His son Stanley took over running the business. In the blitz of May 1942, Sidwell Street was badly hit, and all the shops from the corner of York Road, down to the church were destroyed, including Panters. By 15 May, Panters placed a simple advert with their new address at 26 Goldsmith street. 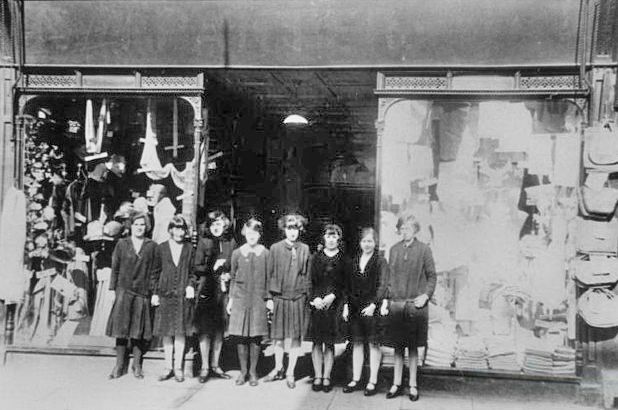 After the war, they moved into a new store, almost exactly on the site of the old 36 sidwell Street. In the intervening years, Panters opened a store in Exmouth and developed an online service. 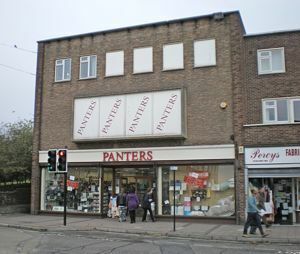 Then, after 120 years of retailing in Exeter, Panters announced the closure of their Sidwell Street store in September 2014. The Ark pet store group announced that they were to open a branch in the old Panter’s store. Source -Western Times, Exeter and Plymouth Gazette and Express and Echo. Panters at 32 Sidwell Street. Staff outside the Panters store at 36 Sidwell Street. An advert from 1924.